Military jets are set to fly from the BAE Systems factory at Brough in East Yorkshire for the first time in a decade, officials have confirmed. Aeroplanes have not flown from the manufacturer's factory runway since it was decommissioned in 1996. Hawk jets made at the site are fully assembled, but had been transported by road to another site in Lancashire. On Monday afternoon a demonstration version of the Hawk took off from the site to mark the resumption of flying. The company is currently producing Hawk jets for the Indian Air Force and the UK Ministry of Defence (MoD). 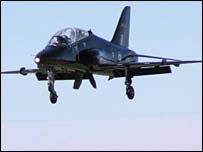 In 2004, the MoD awarded a £160m contract to the firm to design and develop the new Hawk trainer jet.